The Book: “Silence Please” by Arthur C. Clarke. Originally published as “Silence, Please!” in Science-Fantasy, Winter 1950. 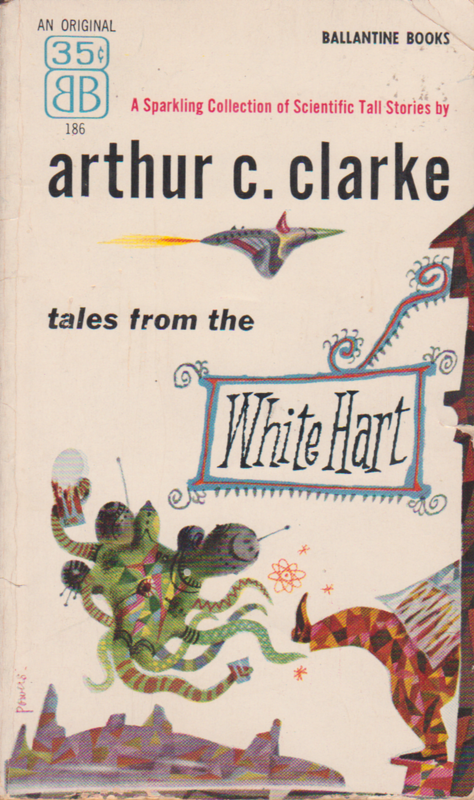 The story was read as part of Tales from the White Hart published by Ballantine Books in 1957. The Setting: The White Hart, England, Earth. The Story: A man at a pub tells a story about a man who invents a machine that cancels out sound and is used, naturally, by a spurned love. The Science: To cancel out sound, the target sound is captured, amplified, and inverted, effectively canceling it out. That’s in the story. Which is pretty much exactly how it works in reality. Well done, Mr. Clarke. The Reaction: A nice enough little story, but not very memorable as evidenced by the fact that I completely forgot it between reading it and blogging it – a period of a month or so. The Cover: Same as before . Next Up: “Incommunicado” by Katherine McLean.